Aldon Smith, the linebacker for the San Francisco 49ers, had one of the most impressive rookie seasons in recent history this year. He was a major reason why the 49ers won their first NFC West Championship title in a decade and came within reach of making it to the Super Bowl, losing to the New York Giants in the NFC Conference Championship game in overtime last week. Smith racked up an amazing 14 sacks. He is also in the running for the Rookie of the Year award. 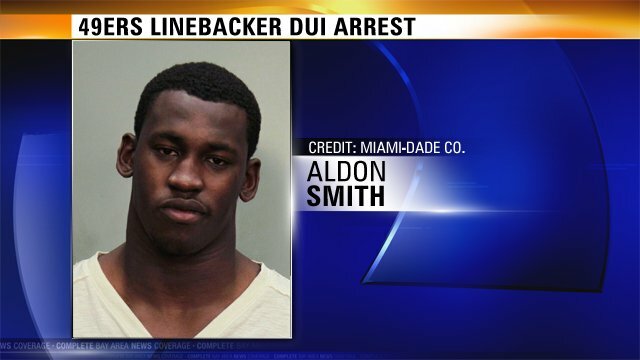 But early this morning, Smith was pulled over by Miami Beach police. At 9:32 EST, Smith was taken into custody for DUI. He was officially arrested and charged with the crime. His bond was placed at $1,000. The Missouri alum is only 22 years of age. As of press time, no statement has been issued by Smith or the 49ers. It is sure that there is much disappointment about the situation. Smith has been a star player who has displayed great maturity on the field, in practice, in the locker room, and in every aspect of his young career. It is uncertain if the 49ers will seek to punish Smith in any way or if they will decide that being arrested and charged is enough punishment for the outstanding athlete.